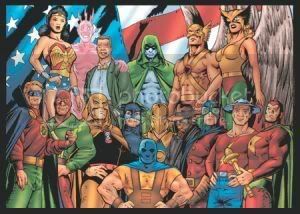 Formed in the 1940s, the team has gone through a revolving roster of the world’s top heroes, gradually losing popularity as other, cooler superhero teams come into favor. I remember dismissing this exact concept the first time around, when it was called The Justice Society of America… a comic book published by DC Comics starting in the 1940s. Of course, the comic book doesn’t benefit from the talents of producers like Saturday Night Live‘s Seth Meyers and Lorne Michaels. I’ll give the show a chance when it premieres in the new season. And then judge it severely, of course. Webcomic: Eggs Goes (in)to the Movies! #2: Surprise!